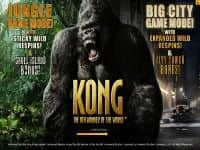 Casino.com Review 2019 - Get Your €/£/$100 FREE Bonus & 200 Spins! Visit Casino.com Get Your Bonus! Fully licensed and regulated. 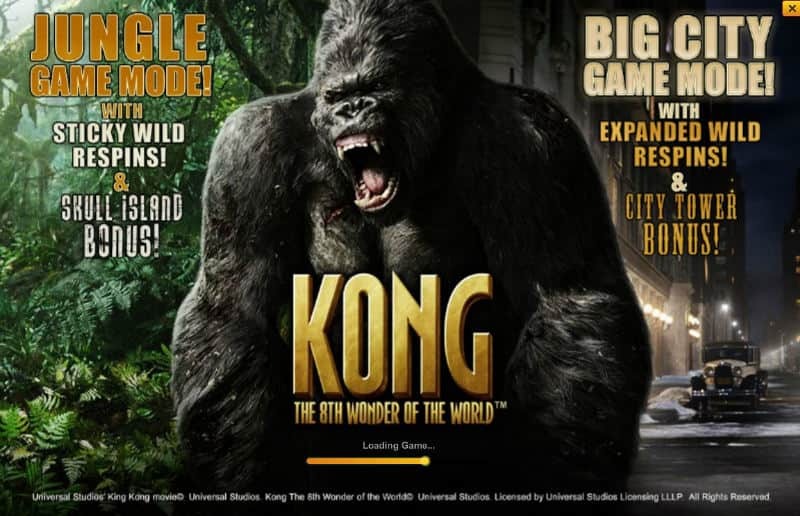 Licensed by the Gibraltar Gaming Authority Casino.com also promotes responsible gambling and the software is licensed by the Gibraltar Gambling Commission. Safe & secure banking methods ? All legitimate, real-money online casinos like Casino.com have strict anti-fraud screens, and that may create a short withdrawal delay. Casino.com will match your first deposit at 100% allowing you to earn up to €/£/$100 in bonus cash. T&C Apply i 18+ only, new customers, £20 min deposit, max bonus £100, wagering 40x. Game weighting applies. Betting limits: Slots - £5, all other games - 10% of bonus amount. 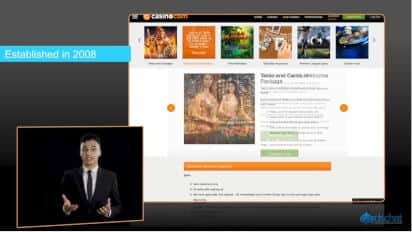 Casino.com was established in 2008 and has quickly become a global brand. The casino is owned and operated by ONISAC, Ltd., licensed in Gibraltar, and powered by Playtech, a highly regarded provider well known for its innovative approach to game design and quality graphics. The state-of-the-art software, available in 46 languages, is simply downloaded to your laptop or desktop and gives you full access to every Casino.com game in minutes. If you'd rather avoid downloads then you can also opt for the in browser option where instant play games are available. The Casino.com games are also playable on your mobile device. Casino.com is enjoyed by players from 189 different countries worldwide. Unfortunately, the U.S. is not one of them. Some online casinos are huge, with more games than even many land-based casinos have to offer; others are hole in the wall operations with only a bare minimum of games. Casino.com, with 200+ games falls in the middle-not so many games you are overwhelmed and can't make up your mind what to play, yet on the other hand enough so you won't quickly become bored due to lack of options. If you’re a slots lover then this casino couldn't be a better option. To begin with, in meeting the wagering requirements for the Welcome Bonus, as well as any subsequent bonuses that you may receive, slot play, unlike most of the other games, counts 100%. In addition, you have a very wide selection of slots from which to choose. Whether you're an avid multi payline slots fan or a progressive jackpot junkie, Casino.com has them all. Table game players also have plenty of options. If you thought there was only one way to play blackjack and roulette, Casino.com will quickly show you otherwise. This casino offers no less than 7 variations of 21 together with 9 variations of roulette. For example, you can choose between Classic Blackjack, Blackjack Surrender, Blackjack Switch, and 21 Duel Blackjack (which uses a community card). Whether you're a beginner to the game or if it has been a while since you last played, you easily get up to speed with the Rules of Blackjack page to help new players learn the basics. In any case, if you are playing a variation of the game you are not familiar with, you should learn about any rule and strategy changes particular to that form of the game. If you would like to try something different in roulette, a good place to start is with the more favorable European or French Roulette (with just a single zero) instead of American Roulette (with a double zero). Some of your other options include 3D roulette and mini roulette (with just 13 numbers). Still another option is to play real money 21, an online roulette variation, or a card game such as baccarat with a live dealer. Seeing the black and red squares of the roulette wheel slowing to a stop or checking your poker hand for the first time and maybe even talking to your fellow online players, it's easy to blur the lines between playing online and in a real casino. In any case, if you are playing a variation of the game you are not familiar with, you should learn about any rule and strategy changes particular to that form of the game. If you would like to try something different in roulette, a good place to start is with the more favorable European or French Roulette (with just a single zero) instead of American Roulette (with a double zero). Some of your other options include 3D roulette and mini roulette (with just 13 numbers). Still another option is to play real money 21, an online roulette variation, or a card game such as baccarat with a live dealer. 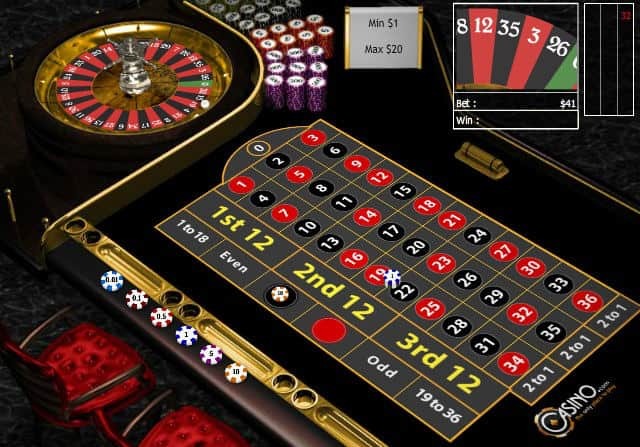 Seeing the black and red squares of the roulette wheel slowing to a stop or checking your poker hand for the first time and maybe even talking to your fellow online players,, it's easy to blur the lines between playing online and in a real casino. Casino.com gives you a choice of more than 30 banking methods, mostly with high limits, so you should have no problem finding a quick, easy, and dependable means of funding your account. Withdrawals are with the same method used for deposit. Withdrawal processing time varies, both with the method used and with the player's loyalty level. Processing times range from just two business days with Skrill and Neteller to up to a week or longer for some of the other methods. No matter which method you select, state-of-the-art encryption technology ensures that all of your financial transactions are kept completely safe and secure. All of your personal information is fully protected as well. Required playthrough for withdrawal: 40x bonus. Casino.com, like most reputable online casinos, offers all new customers joining through Cardschat.com a generous Welcome Bonus. Although the casino promotes the bonus as being up to €/£/$100, in reality the upper limit for the Welcome Bonus is $400. The way that some new players might actually receive a lot more in bonuses-up to €/£/$100, is by subsequent weekly reloads to their account. Since the terms and conditions are different, this review describes these bonuses separately. The Casino.com Welcome Bonus is 100% of your first deposit up to $400. You then have 30 days to meet the playthrough requirements for withdrawal which amount to 40x the bonus. For more information you can also see our Casino.com bonus code page. Compared to the playing requirements associated with many other Welcome Bonuses, these terms are not unreasonable. At many online casinos you are required to play through both the bonus and the associated deposit, and some don't let you keep the bonus. Unfortunately, table games are excluded when it comes to working through bonus requirements, making the Casino.com Welcome Bonus redundant for anything other than slots. If you have any questions about bonuses or any other casino related matter, Customer Support is available to help. The service is offered in many languages via live chat, phone, or email 24/7. Far from forgetting about you once your opening weeks at the casino are history, Casino.com continues offering generous rewards and incentives to keep you coming back. For starters, every time you play you earn loyalty points, which you can accumulate and exchange for cash. Different games earn points at different rates, with slots and scratch cards earning points the fastest. In addition, the number of points you have earned determines your loyalty level-Bronze, Silver, Gold, VIP, or VIP Elite. To qualify for VIP status, players need 20,000 points and deposits over $3,000. VIP Elite status is by invitation only. Players who attain VIP level status receive a personal account manager, higher redemption rates for loyalty points, bigger bonuses, larger deposit and withdrawal limits and faster withdrawals, gifts on their birthday and anniversary, and invitations to exclusive events. One you achieve VIP status, you maintain it for life. At Casino.com, there is seemingly no end to these. Not all players will be able to take advantage of everything offered, but the casino certainly deserves credit for creativity. Just, be careful about how often you access and use the non-withdrawable reload bonuses to avoid getting into a cycle of chasing and re-chasing losses during a dry spell. Here is a brief summary of the various special promotions going on in the casino right now. Starting with the month following your first deposit, for 7 consecutive Tuesdays, the casino will give you a 25% bonus on every deposit of $50 or more. The maximum bonus each Tuesday is $400 (on a total deposit of $1,600). The Tuesday Reload Bonus is how the casino comes up with what is described as a Welcome Bonus potential of $3200. If you get the maximum $400 bonus each of the 7 weeks, that $2,800 on top of the first $400 does indeed bring the bonus total to $3200. It's worth flagging that the different bonuses on offer (Tuesday and first deposit) work differently. This time you only have one week, not a month, to do everything required to fully qualify for your bonus winnings. To be crystal clear the monetary cash value of the bonus offeris not withdrawable. Furthermore you need to have fewer than ten dollars in your bankroll to be able to claim the Tuesday Bonus under the casino's current T&Cs. As a special thank you for signing up to Casino.com, every $50 deposited at any time in month two of your membership is rewarded with a ticket in a random real money prize draw. After the big prize is awarded, there is a nominal pot for everybody else, either a $10 bonus or another higher value incentive. If you enter the code FIRST1, the casino will match any amount you upload to your account 100% to a level that's in line with your current membership status. Each time you reload your account from the 9th through the 11th of the month with the code MID-MONTH, you get a 25% reload bonus up to a total of $500 each day. Receive $50 for each friend you refer who opens up an account and does everything required to get their hands on their sign-up bonus. Each bonus then has a lucrative multiplier incentive for you, as thanks for referring your friend. *Refer to casino.com directly for additional terms and conditions. **Works exactly like the Tuesday Reload Bonus, with the same terms and conditions. Most Android and iOS devices won’t have a problem with opening up Casino.com’s mobile casino. In addition to the usual variants, here there is also a casino option where you can place your bets through your phone, rather than through a standard payment method. That means that you have to give even less of your personal information than usual. You will have to download the casino software first, but that will make the games run faster and smoother. Even if not all the games are available through the mobile app, all of Casino.com’s best and brightest stars will be in your hands once you sign up. Whether your device is larger or smaller, the software will adapt the visuals for your screen in particular, to maximize your experience and enjoyment of the games. Another great thing about Casino.com is the fact that it accepts most of the mobile-friendly payment methods you have heard of, and some you might not know, so keeping your finances in order will be easy. Between the live dealer games, multiple types of slots, and all the standard table games, in total coming up to around 200, there is plenty to do at Casino.com. For those who are just starting out, there are stunning Welcome bonuses (with some of the usual conditions attached), while for those who have been playing for a long time there is a special VIP program that leads to lots of offers and further bonuses. Casino.com is available in nearly 200 countries, and in near 50 languages, which makes it an impressive size. To be able to cope with all of this, it definitely needs to know its job, so you can trust Casino.com to treat you well. Games:Slots, Video Poker, Blackjack, Perfect Pairs, Pontoon, Roulette, Craps, Baccarat, Keno, Caribbean Stud Poker, Pai Gow, Wild Viking, Arcade Games, Scratch Cards, and more! Join Casino.com and earn up to €/£/$100!